Linen Fabric - It's Been A Classic Choice For Generations of Sewers! Linen Fabric - A Classic Choice For Generations of Sewers! Linen fabric has been around almost since the dawn of human civilization. Evidence of its presence is found in almost every part of the globe. Linen was used in the burial wrappings on Egyptian mummies, medieval European shields and gambesons, Chinese garments and even bookmaking. 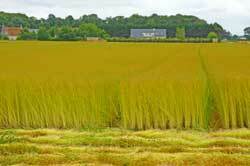 Linen fabric originates from the flax plant, grown in temperate climates. Turning flax into linen is labor-intensive and complicated. It can take several months if done the traditional (and more eco-friendly) way. This explains linen's higher price compared with many other natural fabrics on the market today. Where And Why Should You Buy Linen? Although linen is strong, it is not the softest of fabrics. It is great for use in hot weather because the tightly twisted fibers provide excellent airflow, absorb moisture and wick sweat away from the body.Of course, this means it is equally effective at cooling the body during winter. Most online fabric stores such as NY Fashion Center Fabrics will have a wide selection of linen. These stores are good choices for checking out what's available. Pretreat your linen by washing and drying your fabric several times before cutting out your garment. The fabric will soften over several washes. If you want to keep that crispness for your linen, it's best to dry clean your item. Drycleaning, however, will not prevent shrinkage at a later time should you wash your fabric. Linen washes beautifully. The more you wash linen, the softer and shinier it becomes. Wash gently, using cool to warm water to avoid shrinkage - linen could shrink up to one eighth of a yard per yard of fabric. Linen color will not fade when washed properly. Do not wring out your linen fabric when wet. Hang to dry. Constantly ironing on areas such as collars and hem lines can break down the linen's fibres in that area causing a worn shiny appearance. 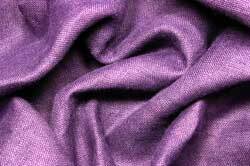 Linen wrinkles easily - it has poor elasticity and does not bounce back to its original shape easily. Make sure to hang your linen item or iron linen when damp. Iron carefully as creases tend to be difficult to remove once pressed into your linen fabric. Linen fabric is lint free. Linen fabric cuts fairly easily using scissors or a rotary cutter and mat. When marking your fabric, it may be best to use tailors tacks if your chosen fabric is loosly woven. Notches would otherwise tend to fray and disappear. Linen sews well and its best to use a quality polyester or cotton wrapped thread for best results. Linen is a beautiful fabric, but is a little on the pricey side. There are many convincing alternatives available. These "linen look" or “linen weave” fabrics are made with fibers like cotton or rayon. They have been processed and woven in such a way as to look similar to and share some of the physical qualities of linen. These imitations are less expensive than linen and often can be used as substitutes. Sometimes it takes a burn test to spot the difference between real linen and a look-alike fabric. Use caution if you want to use this method of identification!